The recent Blogger template consist of thousands line. The code in blogger template is not only for blog appearance but also for template designer control panel. How about the classic blogger template? Can we still use classic blogger template? What is the downside of classic blogger template compare to current one? If we want to learn more simple blogger template we can see The Classic Blogger Template. By Learning this template we can understand the basic concept of blogger template. To do so i create a new blog, use classic template, try to understand the code structure and tweaking the code to get appearance that i want. By learning this, we also simultaneously learning the downside of classic blogger template and we can appreciate more the current template designer facility that has been provided by blogger. The first step is creating a new blog. If you are totally a new beginner in Blogger, you can read the previous article about 'How To Create A Blog in Blogger'. If we choose minimalist Blogger template, we will have the template preview is below. We can see two previews. Live on Blog for desktop look and mobile for mobile look platform. Scroll down until you find "revert to classic template" option. If you can not find the link, probably you have the same problem with me. I use Internet Explorer 9.0 and can not find this option. See the screen shoot below. Try to use Mozilla Firefox or Google Chrome instead. You will find the option to revert classic template. Blogger will give a notification when you click revert to classic template link. One of the downside of using the classic blogger template is to loose Blogger template designer facility. We should code everything manually. I think right now this option has been abandoned by most of Blogspot Blogger. However since this is for learning, i try to be one of the user of classic blogger template. There will be two option after clicking the link, the first one is revert to classic template of view classic template. View classic template option will bring us to the template HTML code editor. The code editor is plainly a text editor. There is no code line number and there is only one black color available. This made coding become difficult in this old classic template. We can only view the code in 'View Classic template' option. Blogger try to scare you of and back off from using old template :). If we are sure that we want to use classic template, please click the revert to classic template link again. Another HTML code editor will pop up with preview and save option. To sneak the appearance of classic template just click the preview button. By default Blogger give a very simple template. It consist of header, blog post area and one sidebar that provide Blogger Profile, Link list, previous post, archive and subscribe to post option. I have applied the setting in one of my blog. You can check the preview on this link. If we examine the code in old classic blogger template we will see that the classic template consist less code compare to current blogger template. But the problem is we can not see how many line exist in the classic blogger template since there is no code line number available. As closing statement for this article, the classic blogger template provide us with simpler coding but there are some downside in template editor and blogger template designer. If you check on the left sidebar, you will not find option for layout setting that is available on current blogger template. We also loose the responsive feature of the blog if we stick with classic blogger template. Below is the preview of the blog i tested using classic blogger template on mobile platform. For the next article i will try to learn the structure of old blogger template. Cheers. 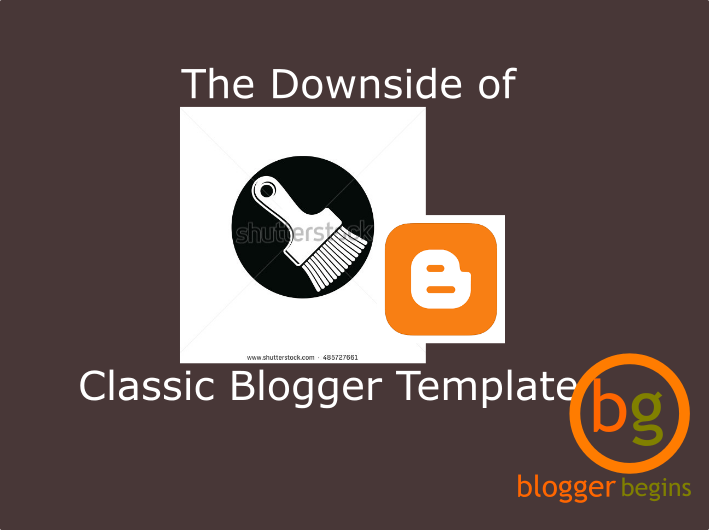 1 Response to "The Downside of Classic Blogger Template"